I recently went on a vacation to Cuba. As I wanted to go scuba diving there, I researched a bit beforehand. The information I could dig up was spotty at times, so I decided to share my notes in order to add it as anecdotal information when planning their diving trips. 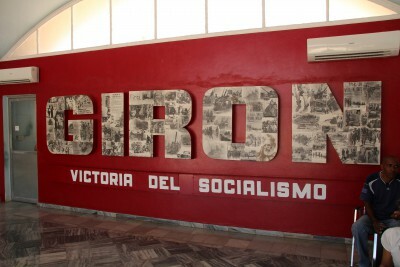 During the 3 week trip to Cuba, I visited three locations in the south-western part of the island. In total, I did 19 dives along the Cuba coast, all of them very enjoyable. On the list were shallow (10-18m) coral reef dives, wall dives, some of them deep. I clocked my max depth at 34.1m. 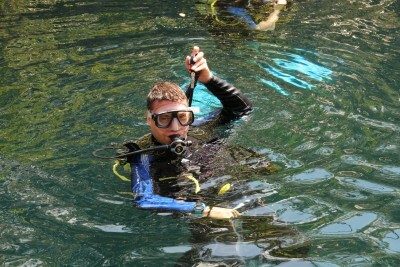 One of the things I wanted to do was a cave dive in a Cenote. Cenotes are underwater cave systems found around the geological area. Cuba is a communist country, instead of Coca Cola advertisements you’ll find some billboard reminding you that “the revolution is invincible”. Economic trade embargoes make acquiring scuba diving gear a problem (although I haven’t seen any shortcomings in this area myself). There’s usually just one dive center running the diving operations, so not much choice, but on the other hand, you’ll rarely encounter crowded dive sites, or reduced visibility due to other divers silting up the waters. Touristic activities such as diving are usually possible through government-owned dive centers. There’s a network of official travel agents across the country, which can help you with booking trips and getting in contact with dive centers. Many of them are not easily reachable by phone, but you can sometimes book in advance of your trip online. In my experience, it would have been fine to just show up at the dive center at the right time of the day with your certification card and dive logs to prove your experience, and you’ll be almost good to go. I decided to bring my own gear, regulator, jacket BCD, 3mm wetsuit, fins, mask and torch in order to avoid any annoyances or unsafe situations due to flaky equipment. My personal experience has been very positive, I loved the different dive sites, guides were generally skilled, and I had a whole bunch of amazing dives in Cuba. Would recommend. Maria la Gorda is a bit off the beaten path in Cuba, one of the more remote locations on the main land. We travelled there from Vinales in 3 hours by car. The location itself is comprised of a hotel, two restaurants, and dive centre on a beautiful beach that also makes for some very nice snorkeling, you can basically walk in and enjoy lots of fish, even those not often discovered while scuba diving. Kim spotted barracuda, jacks, parrot fish, a moray and even an octopus just a few meters off the beach. Diving there is done by boat 3 times a day. Almost all of the diving spots are within a 15min boat ride. 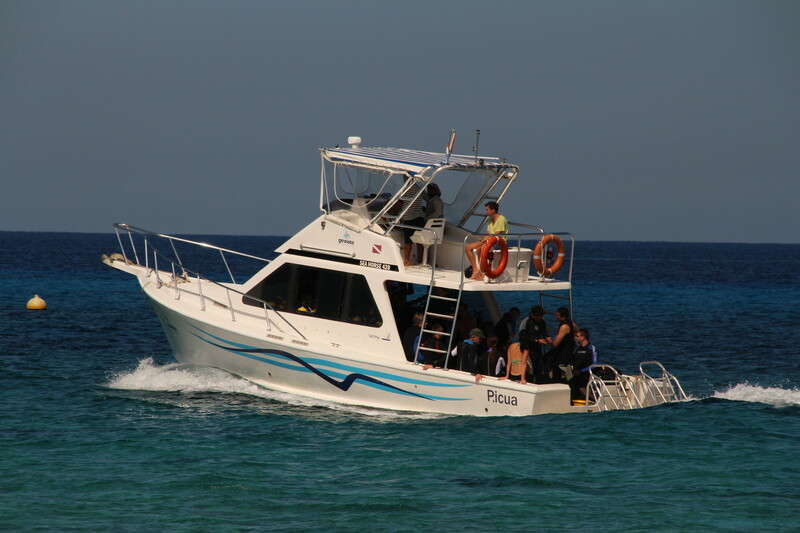 The dive boat goes to 3 different sites a day, at 8:30, 11:00 and 15:00. It’s possible to also do a night dive, but has to be arranged with the staff. If you’re doing a day trip from Vinales just for diving, you’ll arrive in time to do two dives before leaving, the dive center does consider day guests. The surface time in between was enough to not dip too deep into nitrogen levels with 3 daily dives, the first two of them deep. 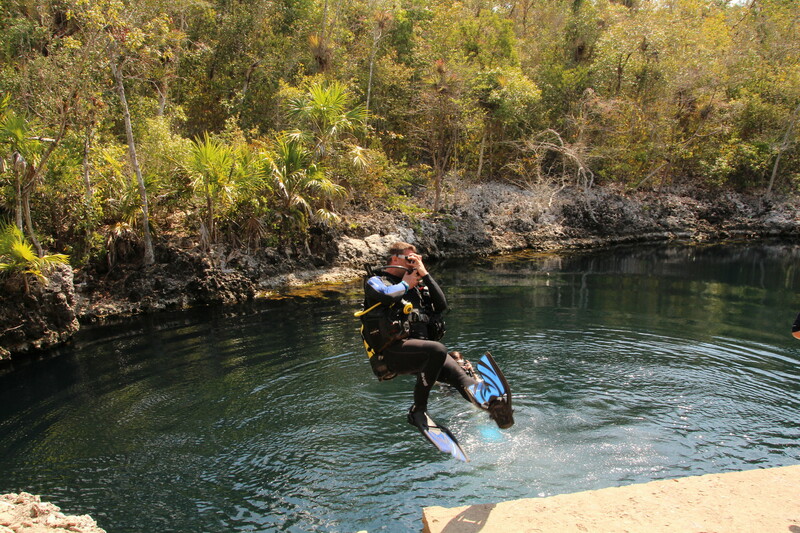 Dives are usually limited to 45′ bottom time. If in general, you can’t get enough of scuba diving, that’s a lot of diving there. The sites I’ve visited were all amazing in their own rights. Beautiful walls littered with coral, dropping down to 2000m right below you, really nice tunnels to dive through, large fan corals, barrel sponges of 3m and more, large groupers, jacks, and the usual variety of coral reef fish (parrot, box fish, angelfish, jacks, butterfly fish, etc.). Fish of more than 50cm in size were no exception, which seems like a sign that at least this part of the Carribean is comparably less overfished than other areas, there and especially in Asian countries. The procedures on the boat were a bit unclear, I had liked to get better introduction there. Other people were happy to help, so this wasn’t much of a problem. The guides’ briefings were too short for my taste, especially knowing a bit about the navigation planned underwater would help to keep the group together more closely and in the end improves safety. I’ve asked the guide to tell me about the planned route under water, which he did in the following dives. That allowed me to take some responsibility myself (I really like to know under water that everybody who went into the water comes out of it as well). That said, there’s always room for improvement, and it didn’t lead to any dangerous situations. Taking responsibility for your buddies is part of diving, and as long as everybody takes it seriously, no problem. The Bay of Pigs is historically known for an attempt by the CIA to invade Cuba with US-friendly troops and overthrow the then-young communist government. Lack of political support from the US government, underestimation of the Cuban revolutionary troops and insufficient secrecy lead to an utter failure of the invasion attempt. 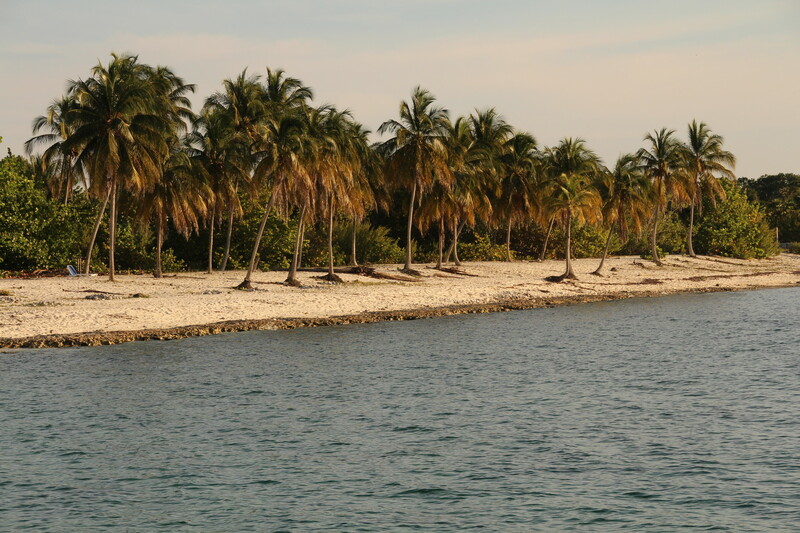 Nowadays, the bay of pigs is a rather calm area, with excellent scuba diving. Basically, the eastern shore of the bay is lined with a coral reef wall very close to the shore. Commonly, one would do a shore entry here, swim out about 100m and then drop into the wall. I dove with Ronel’s local dive operation. A tweaked bus would pick us up in the morning, go to the dive center (next to the government run hotel in Playa Giron) to gear up, and then drive up North for 10 – 20 minutes to one of the dive spots along the bay, then do two shore dives from there. We’d return around 1 o’clock in the afternoon, so there’s plenty of time for other activities (which, to be fair there aren’t that many apart from the beach and a “not-quite-neutral” museum about the failed invasion attempt). 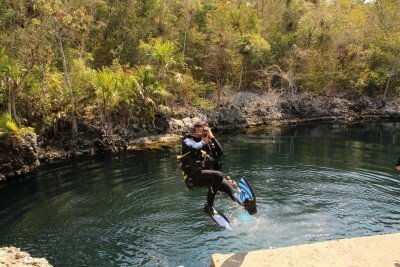 Cenotes are sinkholes in the shallow limestone ground near the coast. Small pools filled with fresh surface waters lead to extended cave systems flooded with salt water, so one enters a fresh water pool in the woods, then descends through a haloclyne. This haloclyne is the border between fresh and salt water. The caves were usually filled with salt water seeping in from the sea, but as there are almost no currents, rain water that comes in from above stays on top as fresh water. The haloclyne produces a weird disturbed visual effect when one dives through it, but above and underneath it, visibility is clear. These sink holes are often quite deep, the one we entered was 26m deep at entry point, the deepest points of the cave system went down to 60m. We entered into a tunnel, a vertical crack in the limestone about 1m wide, so wide enough to comfortably swim through. During the dive, we made our way about 350m into the cave to a maximum depth of 32m. As the shape of the cave determines the dive profile, I ended up having to add an extra decompression stop before surfacing. We went through a lower tunnel into a larger cave, which had some beautiful sunlight shining in through cracks above in blue-green colors. Visibility was excellent, and the sunrays produced an almost magical ray of sunlight in the water of the deeper cave. Through the haloclyne above us, the sunlight was broken by the different densities of air, fresh and salt water until they hit the particles drifting in the water or the walls and bottom and of the cave. This dive was guided by a specialized cave diving guide. Briefings were thorough, and after a first reef dive to check everyone’s buoyancy and general diving skills, we did our second dive of the day in the Cenote. I’ve found this video, which gives an impression how such a dive looks like. If you’re an advanced diver, comfortable with overhead environments and experienced enough, I’d definitely recommend doing a Cenote dive, For me, it’s been an unforgettable experience. Playa Ancón is the beach village close to Trinidad. It’s a peninsula at about 7km from Trinidad. I’ve found it a bit complicated to book the diving there. Tour operator in Trinidad would tell me that everything’s fully booked, but inquiring at the dive center in Playa Ancon, I was told to just show up before 9am and I should be fine. That’s what I did, and it was indeed no problem to go diving there. 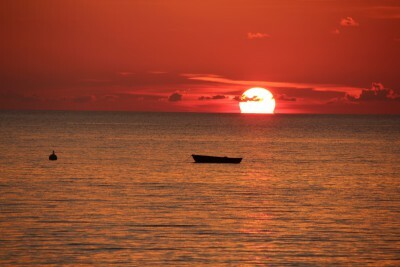 We’d enter the boat from the beach and would go out a few hundred meters, just too much to swim there comfortably. Thank you for sharing your trip, yet I noticed this appeared on Planet KDE, why was that? It also went to planet KDE because I am a KDE developer. Planet KDE’s guideline says: “Blog posts about personal subjects are also encouraged since Planet KDE is a chance to learn more about the developers behind KDE.”, see the ” Add your blog” bit on pko.